NZ's first Vinduro ride at Woodhill was not an enduro but a cross country race. None the less it was a fantastic start for Vinduro riding in NZ. The Waitemata MCC ran a great one hour ride over a shortened version of the historic 40th Dead Toad Cross Country course in Woodhill Forest prior to the main event. Several of the riders who rode the original 1975 event competed again in 2014. Results are to follow, but here are photos taken by Natalie and my helmet cam video to give you a taste what the ride was like. 40 YEARS OF DIRT FOR THE WMCC. 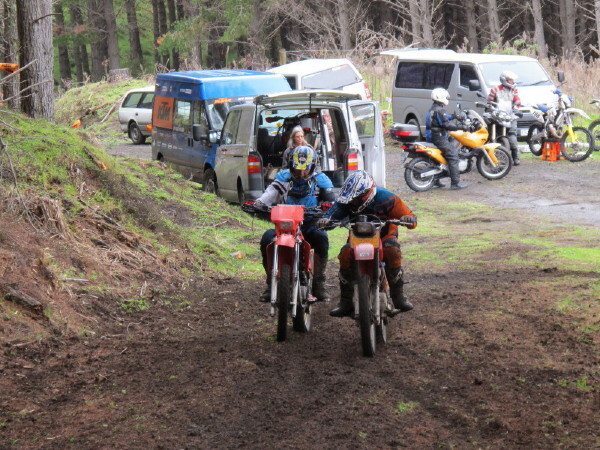 2014 is a vintage year for the Waitemata Motorcycle Club, who are celebrating the 40th running of two iconic off road events. The first of these was the Dead Toad Hare Scramble on Saturday September 13th. 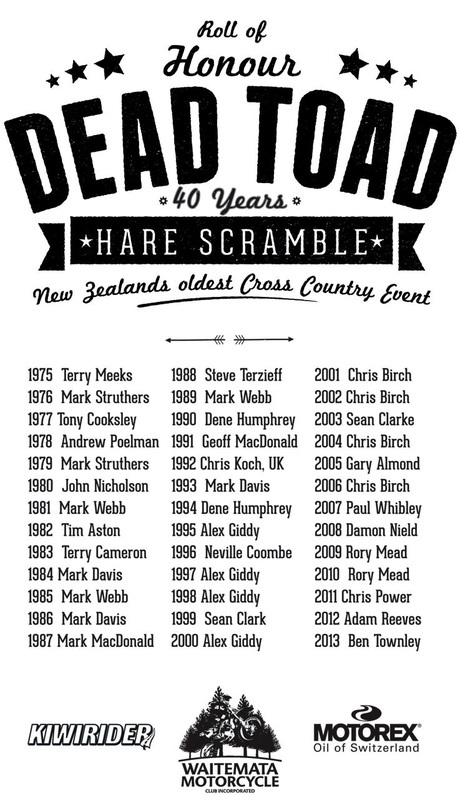 The first Dead Toad was run in 1974 making it NZ's longest running hare scramble. The Dead Toad has been run continuously in Woodhill Forest west of Auckland. 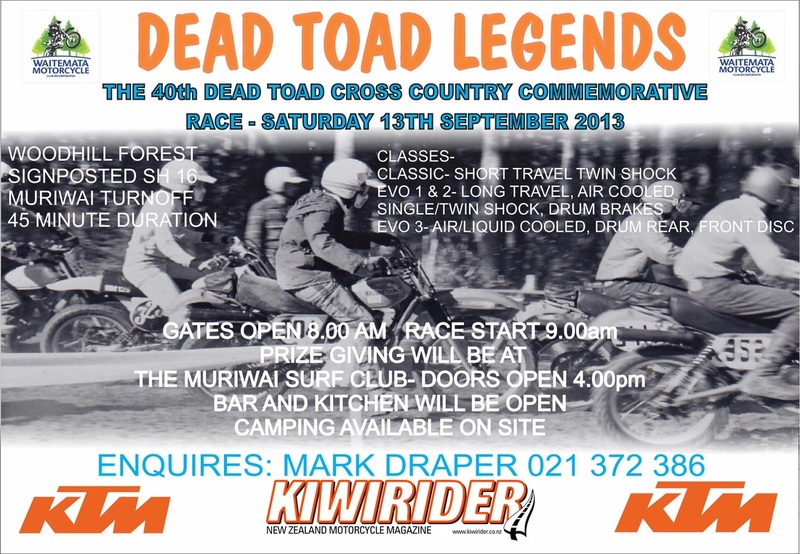 The ride was named by the group of Waitemata MCC members who put on the event and named themselves the Dead Toad Racing Team. The unusual name stuck to the event long after the original organisers went their different ways.Trophies for the event were cast toads, first in metal and in later years ceramic. True to tradition the Dead Toad course is still a mix of sandy 4x4 and single track amongst the pines. To celebrate the 40th running of the event the club ran a special commemorative Legends race for vintage MX Enduro and trail bikes. The Dead Toad Legends ride was a dedicated race on a shortened and easier course prior to the main event on well drained sand and was open to Vintage VMX and Enduro bikes. Several classes are catered broadly following the new Vinduronz requirements. Classic - twin shock, short travel, drum brakes. Evo 1&2 combined - long travel twin shock or single shock, air cooled, drum brakes. Evo 3 - any engine or suspension configuration, must have been manufactured and still fitted with a drum rear brake. More detailed info is available on the Vinduronz website.